GraceLinBlog: can I be called professor? I just finished teaching my section of the Solstice low-residency MFA program in YA/Children's lit and I can't say enough good things about it. I wish I had gone to a program like this before publishing, it's such a smart group of people--students and staff (including the very sharp and funny co-teacher Laban Hill), all passionate about writing. They were especially kind to green-horned teachers, such as myself. I caught myself telling stories like an old grandfather ("I remember when I learned there was no such thing as a brontosaurus...") and their eyes did not glaze over once--true signs of real writers, who know that they can find something interesting in the most mundane of incidents. 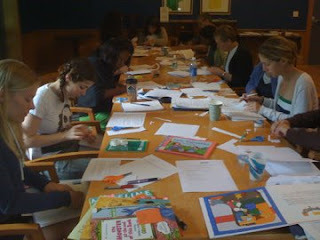 If you are at all serious about writing for children, get thee to a program such as this!